There was some serious cooking going on in my petite cuisine Parisienne this morning. About a month ago, I came across an online quiz + lucky draw to win a home-cooked brunch by renowned chefs, courtesy of Nespresso, in conjunction with the launch of their new capsule line – Linizio Lungo. I decided to give it a go, but was out of luck on both week 1 and week 2. I was expecting another tough-luck-you-didn’t-win email on week 3 when I received one with the header “Felicitations!”. That is how Jean Imbert of L’Acajou, winner of Top Chef France 2012, came to prepare a fantabulous brunch at our place and feeding a small crowd of six, as Frédéric and I were joined by Anne, Hélène, Claire and Victor. Marie, who was coordinating the event, and Juan, an assistant to Jean, were also here. 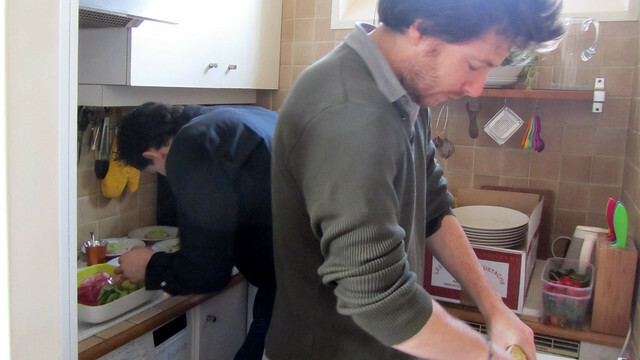 I must say it felt a little strange to have someone cooking for us when usually, if we invite a group of people over, I’d be the one slaving over the proverbial hot stove. 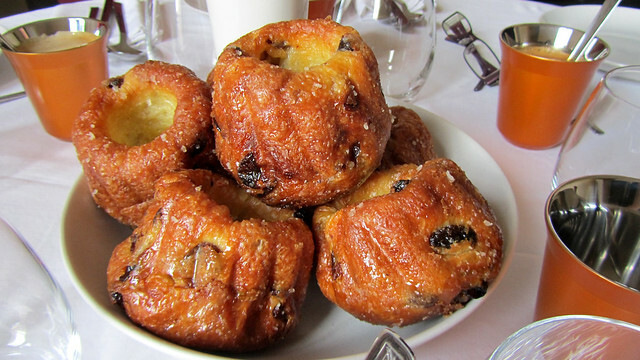 With a cup of Linizio Lungo each, we kicked off the brunch with mini kouglof, a type of Alsatian cake with very distinct shape. The recipe is one from Jean’s grandmother and they have been freshly baked in the morning. This version is buttery, moist and sticky, containing raisins and some sugar sprinkle (perhaps part of a sugar glaze?) – and indeed it makes a nice change from the typical breakfast pastry of croissant or pain au chocolat. We were also additionally served fresh orange juice with a hint of vanilla throughout the brunch. “Avocat, araignée, légumes racines” – my non-Francophone friends were much amused by the Google translation of this item (go on, try to translate it) when I first shared the menu with them. 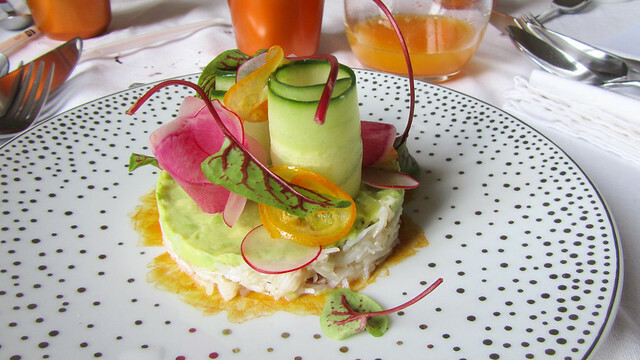 A ring of spider crab, topped with avocado, and garnished with thinly sliced radish, watermelon radish (something new to all of us today), kumquat, cucumber and baby salad leaves, this could easily be a starter course for a summer meal. This was Frédéric’s favourite dish of the brunch. 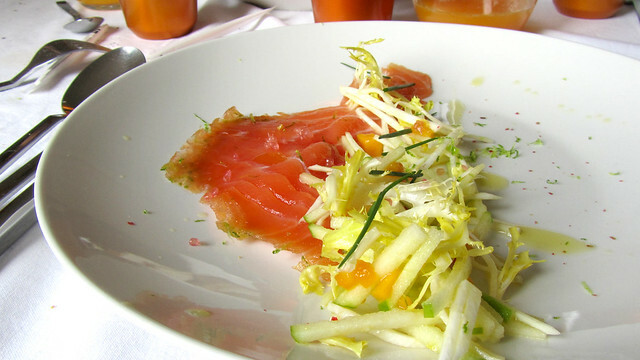 The morning progressed with salmon gravlax, served with oxalys, celeriac and apple salad. And if you look closely, there were some citrus caviar on the salmon, giving the dish a light and refreshing citrus flavour. Freshly ground pink peppercorn gave it another dimension of delicate seasoning. A brunch classic, reinvented. Supposedly, our fourth course of the brunch has been cooking for a while in the kitchen. Œuf parfait required cooking at a low temperature over a certain period of time (what was it – 55 minutes at 61°C? ;) ) and it was served with some creamy polenta and some cured ham. Or what the French calls “bacon”. For a girl who lived in Ireland for years, bacon to me can only be of the kind like that served as part of Irish breakfast, grilled and crispy. 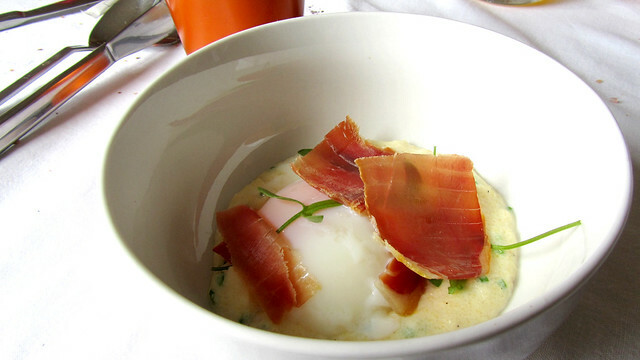 As I love soft-yolk egg, this was cooked to perfection but I bet crispy bacon would have make the dish even better! As the brunch drew near its end, we were treated to a feast of colour and flavour. 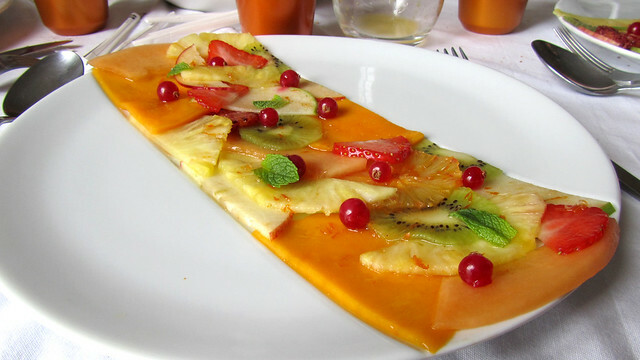 The fresh fruit salad carpaccio with mint was beautifully composed of apple (both red and green), pineapple, clementine, strawberry, mango, kiwi, melon and red currants. It was slightly sweetened with some syrup, but the flavours of the fruits still shone through. This is one of Jean’s signature dish, having showcased it in one of the Top Chef episodes, and a recipe is also available from Top Chef recipe archive (in French). As you can see, we were totally spoilt today, so I’d like to say a big huge merci to Jean, Juan and Marie, and Nespresso for this win. Not only had we an enjoyable family brunch with lively discussion between ourselves, we also occasionally bantered with the good folks who were feeding us all the delicious goodies. I can tell you, if anyone feels like treating me like a princess in this manner every weekend, I wouldn’t say no! Marie has also gifted us with a set of Nespresso cups and coffee capsules. 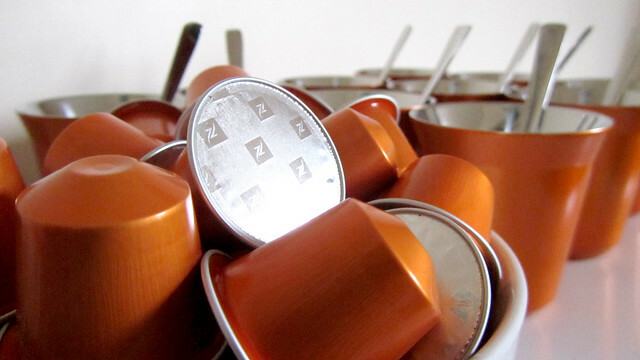 As we do not have a Nespresso machine (I think we are one of the very few households in France that doesn’t have a coffee machine of some kind – our poor visiting friends are always stuck with instant coffee, sorry!) we were pondering if it’s time to buy one and take up coffee drinking… On the other hand, if anyone’s looking to test the Linizio Lungo, give me a shout and I’ll try to supply you with a couple of tester capsules. They made all that in your little pantry?? Except for the kouglof, and the orange juice already bottled in their kitchen and brought over, yes! And you’ve seen the size of the place – I measured it this morning and the standing space is a little over 1m2, that’s it. Sooo impressed. Lucky you, that looks delicious!